Wish You all a very Happy Pongal. Celebrate this Tamizhar thirunaal with your family and friends.Chettinad Poondu kuzhambhu | South Indian recipes – a famous recipe in chettinad cuisine. Once I ate this poondu kuzhambhu in karaikudi at my friend’s place. After that I have tasted this in anjappar. 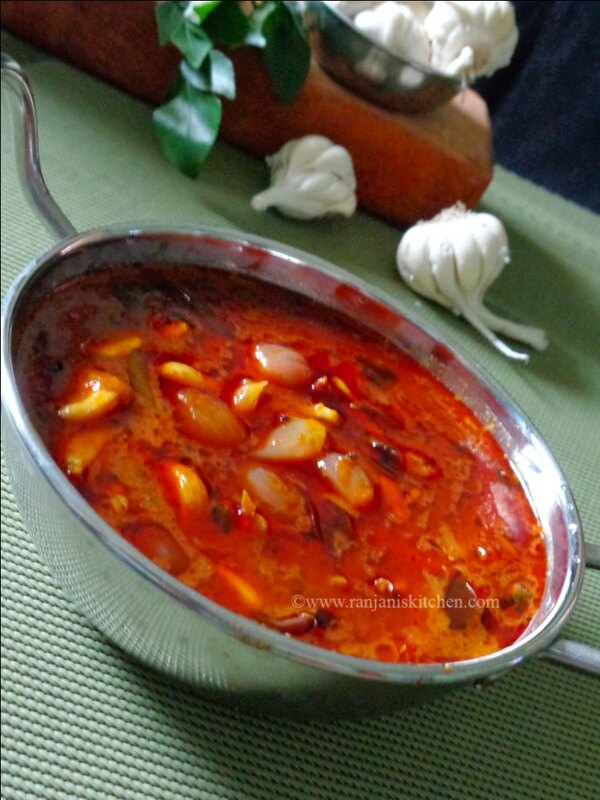 Such a spicy and aromatic kuzhambhu goes well with steamed rice and any kind of kootu or avial recipes. 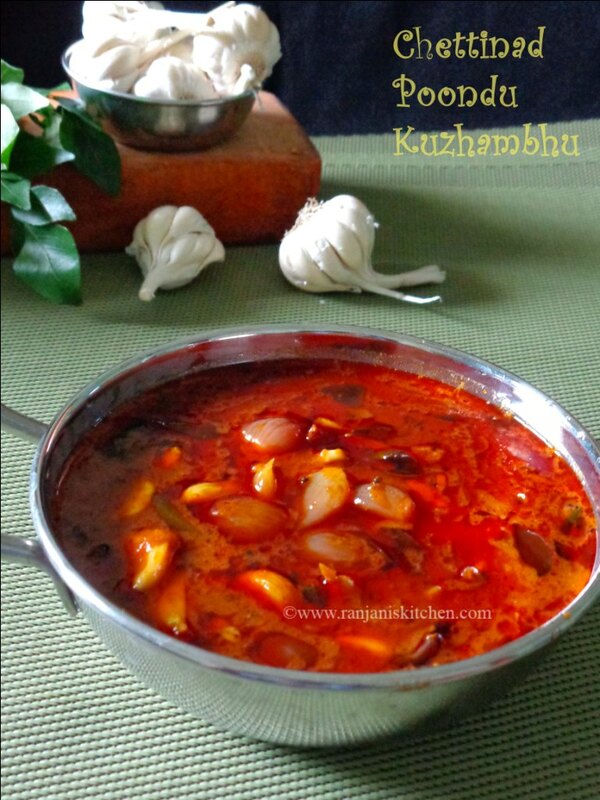 It’s a very tasty and healthy kuzhambhu due to the addition of more garlic. I made it in clay pot. My grand ma used to cook in earthern pots during childhood days. There is no word to define the taste. Its ultimate divine.One more thing, addition of sesame oil will increase the taste.Also it’s a perfect accompaniment for idli and dosa.So friends make healthy and eat healthy. Once again, Wish you all a very happy pongal. Shallots (Small Onions) – 10 nos. Dip salt and tamarind in hot water for ten minutes, squeeze and extract the pulp.Add red chili powder,coriander powder, sambar powder and chopped coriander leaves to it. Mix with enough water and keep aside. Peel garlic and shallots.Chop tomatoes and set aside. Crush ¼ part of garlic and keep it for tempering. In a wok or kadai, heat oil, fry the garlic flakes, drain the oil and set in plate. 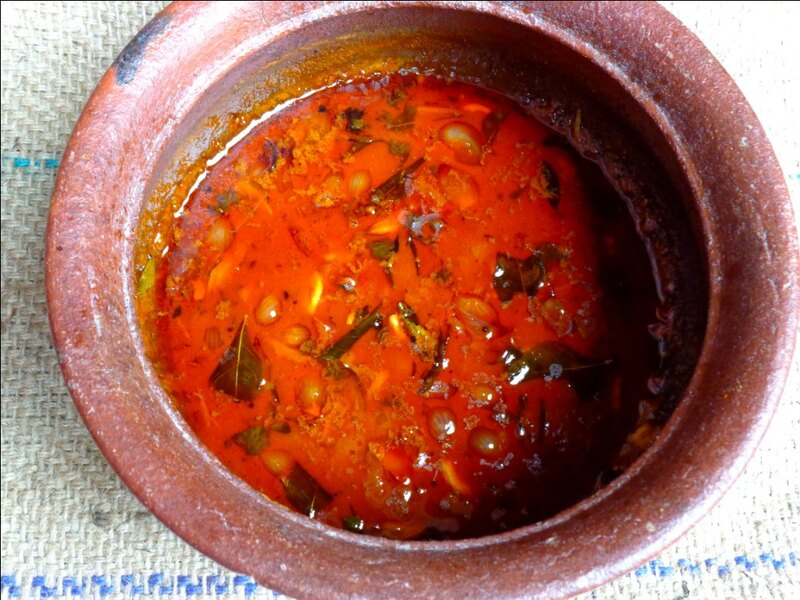 Temper in the same oil with mustard, fenugreek seeds , cumin seeds and curry leaves. Add shallots, crushed garlic to it, fry for a minute and then add chopped tomatoes. Sprinkle some salt over it and stir until it gets fully cooked. After the oil oozes on sides, Add the tamarind water mix up with spice powders. Mix well,once it starts boiling, add fried garlic,jaggery and hing. Allow it to cook till it becomes semi thick and the oil stands on top.Turn off the flame and serve with steamed rice. Frying method of garlic will allow to fast cook the garlic. Also it tastes different. Use ripe and pulpy tomatoes for good taste. Do not skip jaggery, it’s the best taste enhancer for this kuzhambhu. I love this and also my dad’s favourite…!! Yummy recipe! Love this kuzhambu.. One of my fav when i visit Karaikudi. I feel like having that curry now with hot rice.. Delicious. 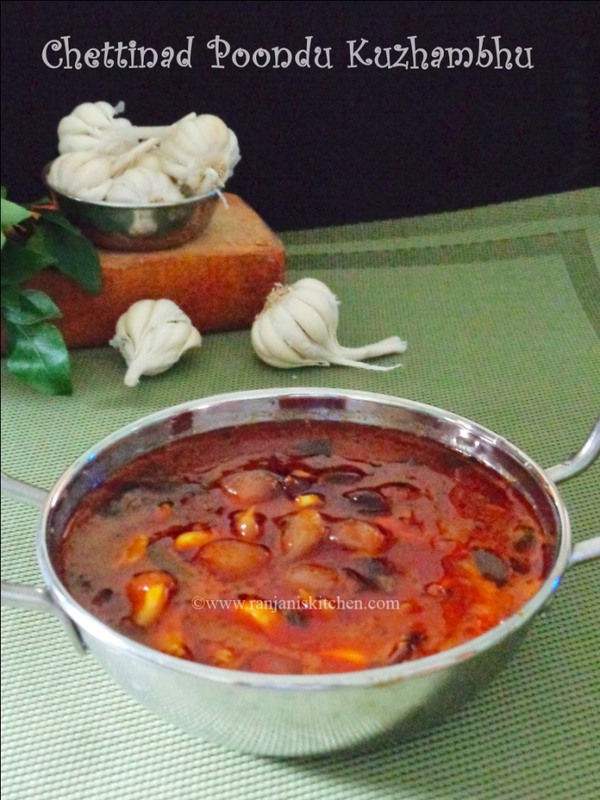 when to add the jaggery?